This is one of those weeks where averages are my friend. I had 2 non-writing days but still averaged 500 words a day. I compiled and transmitted all my notes to the author of the manuscript I beta read, and found a fourth beta reader for my own manuscript. I worked up enough nerve to put two erotica shorts out there for critique. So far so good, but I restricted my audience. If I’m feeling really confident, I may also post one over in AW’s critique forum…gulp. That’s where the women are separated from the girls, for sure. My two ultra short entries are now flying through the internet two days BEFORE the deadline. Prize for this is $50 and publication in a printed anthology. A fellow Scribophile member found a cool anthology to submit for, with a due date of 3-31-11. That’ll be my March contest goal, though technically it’s a submission and not a contest, but the two are interchangeable to me. So, I’m still on plan and making good progress on at least one of my three projects. A running tally of my stats is here. 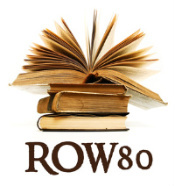 The Linky site with links to all the other ROW80 participants’ progress reports is here. Give ’em a read and a bravo if you can. You’ve had a great week. I like that you’re taking your stort story critique in steps. The feedback from the smaller group helps you get ready for AW. Keep going – you’re really on a roll! I’m learning a lot from visiting other participants…I’m not familiar with the critique sites, but I’ll have to explore them…. Oh hurray then. I’m still trying to figure out where my best talents and interests lie, so I love experimenting. Glad to inspire the same. Rockin’ as usual – thanks for keeping the good work, and talking about it – you help show the process as ‘do-able’. Keep it up!! Thank you! It is indeed doable when broken into bite sized goals. Something I’ve learned from this exercise as well.